Lower Back Tattoo Designs - Tattoo ideas for girls and women to consider when getting a lower back tattoo. Women often choose tattoo designs that visually elongate their legs and arms, narrow the waist and draw the eye to the natural curves of their hips and bust. Even when choosing to get extensive tattooing, such as with a full sleeve or a back piece, women often make use of a lighter and more delicate colour palette, as well as a judicious use negative space within the tattoo and a choice of a design that one might categorize as feminine, floral designs, butterflies, etc. Japanese tattoo designs are other popular choices for lower back tattoos, as tattoos like dragons and snakes, or the feathers of a phoenix or other bird can easily be wrapped around hips or flow around the waist. Maple leaves or cherry blossoms floating on water or the wind can have a similar effect, as can koi fish in a stream. When choosing a tribal tattoo design, it is important to balance the weight of extensive blackwork with the judicious use of negative space. It is important to remember that the areas of your skin NOT tattooed within a tattoo design are every bit as important as the areas that are inked. Many Polynesian and Maori designs make excellent use of this design philosophy. 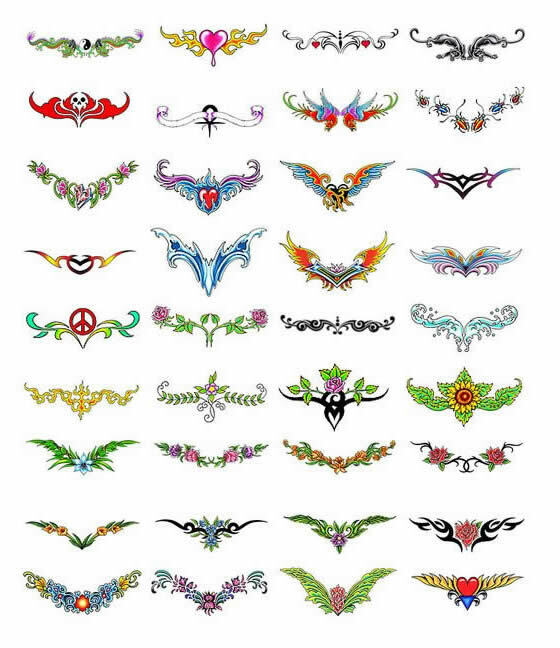 Once you've chosen your lower back tattoo design, you still have a couple of decisions to make. What shape is the tattoo design? Is the design triangular, circular or oval, vertical or horizontal? A horizontal tattoo design will appear to make any the part of your body it is tattooed on wider (which is why a lower back tattoo is usually and probably should be V-shaped). A vertical design will elongate the body - think of a vertical row of kanji designs along the spine. Do you want people to be able to see the tattoo when you are in public? Do you want to be able to conceal it? You may still want to wear a backless dress to a professional function and not have your colleagues know you have a tattoo, or perhaps your Grandmother at a wedding. Once you are in a tattoo shop, the artist should be happy to discuss with you the best location for your design, even going to the time and effort of stencilling or roughing in the tattoo so you can make a final decision. Being able to see what the tattoo design will actually look like on YOUR body is a critical part of your decision making process. When choosing a design specifically for the lower back there are a number of factors to consider. The first is that your lower back offers you and the tattoo artist one of the largest expanses of 'canvas' on your body to work with. Proportion is an important factor to take into consideration. A small tattoo in the middle of your lower back is at risk for seeming out of place or looking 'lost'. Ideally, a lower back tattoo should be 'V-shaped', with the lowest part of the tattoo centered near the tailbone, or as close to the crease of your buttock's as you feel comfortable. The design should follow the natural curve of your lower back as it blends in with the curve of your waist and pelvis and the top of your hips. Every woman is unique, and her lower back tattoo should reflect each woman's own unique shape. If this is your first tattoo and you are reluctant to get a large design, talk about this with your tattoo artist and consider getting a tattoo that can more easily be enlarged at a later date. You may start with one flower design, and then as time passes, add additional flowers, or other tattoo designs that integrate well with your first tattoo. Some women start small and over time end up with a beautiful garland of flowers draped over their hips, a tribal tattoo design that lengthens their legs and narrows their waist, or a cloud of butterflies that seems to float around their waist. 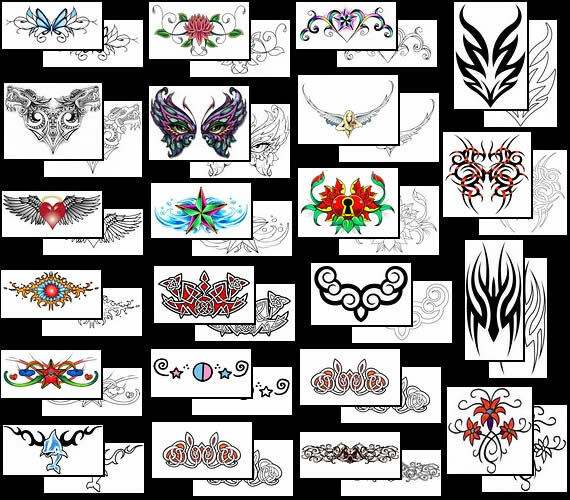 Choose your own lower back tattoo design from Tattoo-Art.com. Find and buy the lower back tattoo design that is perfect for you.